Yet another fascinating layer of Cardiff is peeled away by Peter Finch in his latest volume, Real Cardiff - The Flourishing City. It certainly does flourish as this insightful Cardiffian continues his exploration of the obvious and hidden vistas of the city, discovering new treasures and revisiting past haunts to find them drastically altered over just ten years. Finch reveals a rapid pace of change, overtaking even the industrial booms of the city's nineteenth century heyday, and the clearances and redevelopment of the 1960s and 1970s. The book is a typically eclectic mix, as Finch walks through the city and through his memories, locating the odd and the outlandish and measuring them against the everyday. Here are the last days of Dic Penderyn, a litany of rock and roll on Queen Street, the battle for the Vulcan pub, the lost mansions of the east, the culinary odyssey of City Road, Roald Dahl in Radyr, the Lido at Llandaff, the Coast path, and a journey round the city's mosques, among many other strolls and diversions. There is always more to discover in Cardiff, as Finch keenly, humorously, interestingly, and consistently reminds us. Peter Finch follows the trail of twentieth century popular music from a 1950s valve radio playing in a suburban Cardiff terrace to the reality of the music among the bars of Ireland, the skyscrapers of New York, the plains of Tennessee, the flatlands of Mississippi and the mountains of North Carolina. The Roots of Rock from Cardiff to Mississippi and back mixes musical autobiography with an exploration of the physical places from which this music comes. It is a demonstration of the power of music to create a world for the listener that is simultaneously of and beyond the place in which it is heard. It also considers how music has changed during this time, from the culture-shaping (revolutionising) 50s and 60s to the present day, where it has evolved from the hard black vinyl of albums to the invisible digital mp3 file waiting to be summoned by mouse click. Along the way Finch gives us sharp-eyed accounts of gigs from Champion Jack Dupree to the Garth Mountain Boys, muses on the importance of the Dansette record player, ponders why Elvis never came to Wales (except multiply in Porthcawl's legendary Elvis Festival), visits musical shrines and theme parks - Dollywood, Grand Ole Opry, Graceland, Stax, rides along with singing cowboys and recalls his attempt to form a band, The Blueswailers. Add in music in Ireland and Wales (and in Welsh), the Bible Belt, Sister Rosetta Tharpe, Etta james, Ray Charles, Bert Jansch, Taylor Swift, Alan Stivell, Chet Atkins, the Appalachian Mountains and Pigeon Forge and Finch's world of music is as broad as the last six decades allows. Each chapter is accompanied by a multi-track play list to help the reader have the full flavour of what Finch's musical experiences and bring alive the many sharp witted stories and thoughtful cultural connections. The result is an entertaining, informative book from which the reader will learn much and hear more. 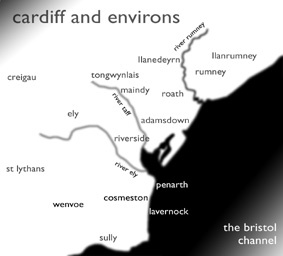 Cardiffian Peter Finch discovers the real Cardiff: lost rivers, Roman forts, holy wells, itinerant poets, the old race course, the revitalised city centre, the redeveloped Cardiff Bay, as he travels the city from east to west and north to south. All Cardiff is here - not just the tourist destinations. The estates of Ely and Grangetown sit next to elegant Radyr and Lisvane; the new bars jostle with the old pubs; the terraces of Splott stand by the grandeur of the castle and the civic centre. What do visitors make of the place? Meet the Japanese tourist puzzling over Castell Coch; get banned from the pubs of Llandaff with novelist George MacBeth; listen to the Beat poets in town. Meet the locals too, with their mix of diffidence and civic pride. And see how Cardiff is changing, from Finch's youth in the sixties to the chrome and glass of today; from capital city to seat of government; from thriving docks and steelmaking to call centres and the new tourism.This is offbeat topographical writing, peppered with Finch's poems, which will enthrall the native, the visitor and the armchair traveller alike. It's celebratory, it's subversive. It's Real Cardiff. 2nd edition, third printing. isbn 1854113852. (2002) Published by Seren Books, paperback, £9.95. Purchase. More information. Here Peter Finch crosses the larger city, hunts for the legendary periferique and discovers rubbish dumps, walled housing estates and dead-end lanes. He walks the coast around Penarth Head and on to Lavernock to find the terminal beach at Sully. With poet Grahame Davies he hunts for the mythical river Canna and uncovers what makes Cardiff media-land tick. With Architect Jonathan Adams he trails where the walls of Cardiff once ran, looking for time vaults and gaps in the city's space-time continuum. How did Penarth's Billy Banks get their name? Why are there so many pubs in Pontcanna? Is it Victoria Park or Canton? Who knows? Not Finch's mother, that's for sure. With John Briggs he walks the route of the Glamorgan Canal, mourning the city's loss. Russell Goodway agrees with him. But he's lost too, now. In the Bay he looks at what went before the new Wales Millennium Centre and what might have been. Out at Creigiau he finds cromlechau and extant past in a city full of trees and slopes. The welsh Office is surrounded with salt to keep the demons out. John Tripp has his wake at the Gower in Cathays. There's a folk-club in the Locomotive along Broadway. Queen Street Station has passages you can't get to where the Taff Valley Railway still steams. There are other secrets running inside the overbuilt city. Finch tells us what they are. In Real Cardiff #2 Finch no longer has his nose pressed against the glass. This time he's inside. isbn 1854113844. (2004) Seren Books, paperback, £9.99. Purchase. More information. In the seven years since Peter Finch wrote Real Cardiff the city has changed enormously, especially in the centre and Cardiff Bay, where the latest phases of development are coming to fruition. Post-industrial Cardiff is one of the themes of the final volume in the Real Cardiff trilogy as Finch observes the new city and continues on his authorial dig through the places and people who made the city what it is but have now disappeared. At one end of Finchs new map of the city lies an inspection of St Davids Two, the new shopping development; St Davids Five Star, the luxurious winged hotel in the bay; the apartments lining the Taff and the barrageheld lagoon; the barrage itself; the Senedd, and Dr Whos Cardiff time travel. At the other, time-travelled, end are places which shaped the past or have now disappeared: the race course; Whitchurch Castle; the old barracks; Lower Splott, catching trains on the citys lost railways; and exploring the mystery of Roath brook. The mix of present and past is a rich one which leads Finch on a fascinating journey of pathos and comedy, nostalgia and blistering contemporary commentary in another volume thats sure to be as popular and well received as the first two. Real Cardiff Three isbn 978-1-85411-505-8 (2009) Seren Books, paperback, £9.99. Purchase. More information. In the latest ambitious offering from the Real series, following acclaim for Real Cardiff and Real Cardiff Two, Finch takes on the alien land he didn't know was his, until he grew and went to see it: Real Wales. A cotton-wool nation, full of football and big-brother slim-screen television, or a land of demons, where white robed druids would wail at you through a never ending mist? In muscular, syncopated and witty prose, Finch presents 30 years of journeys through the familiar, the bizarre, and to all those places on the TV weather map he never before had cause to visit. In a country of small and scattered populations, who are all certain of who they are, and where doubt is a quality none possess, Finch comes across poetry in Merthyr, an abandoned castle in Dinas Powys, UFOs and Waldo Williams in West Wales, Jack Kerouac on the beach at Gwbert, the military at Epynt, bizarre sports in Llanwrtyd, flying gravy in Cricieth, panic on Snowdon, and a stripper at the Royal Welsh. Whether reading a mountain as Braille or clearing a tent at Hay with one poem, Finch seeks to embrace the permanently stern independence of spirit he sees across the country. Personal but never pedestrian, in a country where the past is so near the surface but can never quite be picked up, he accompanies oddballs and novelists, historians and local experts, to find something usually forgotten in a world of oil-powered multi-national commercial empires and federal enormity: Small is beautiful. In the Middle Ages the port of Cardiff stretched from Chepstow to Gower. Peter Finch, archetypal Cardiffian, sets out to explore his heritage, walking the Welsh side of the Severn Estuary and reclaiming his personal memories in addition to discovering the lives of others. And with a detour to Maismore, the highest tidal point of the estuary, he walks the English side too, taking in the differences with Wales, reviving past links and looking at his homeland from abroad. On his journey he sees the estuary as border, a highway for trade and ideas, an industrial zone, and a place where people spend their leisure. Rich in anecdote, evocative in description, Finchs book takes in villages and cities, power stations and fishermen, castles and caravans, leg-aching walks and deckchairs on the beach. The tragedy of Lynmouth, the competing delights of Porthcawl, Barry and Weston-super-Mare, the industrial sites of Usk and Port Talbot, the fate of Cardiff, Newport and Swansea docks, the ancient trackways of Swansea Bay and the Star Inn at Neath are just some of the many stories which punctuate Finchs epic walk along some of the most beautiful coastline in Britain. Seren Books. ISBN: 1854113984 (2005) �9.99. Purchase at Amazon. The new collection of poems by the master of modern angst. Not one for quiet meditations, this voice is: loud, bewildered, satirical, furious, sad, fearful and funny. This is a Wales that missed its revolution in I Chew Gum and Think of Rifles. This is a Wales beset by: rain, the ghosts of hard-drinking poets, of holy wells guarded by heifers, of sports crowds, Ikea, sheep, �enormous storm clouds�, and the Entry of Christ Into Cardiff, 2005. A health scare merits a mini-epic in The Clinic. Elvis is seen in Asda, Merthyr. Travel brings little respite, only access to foreign anxieties and temptations. We visit The Mir� Mini-bar in Barcelona, look for B�lla Bart�k in Hungary, take a road trip to Ireland, find more rain and that �The land gives out in an emerald flail.� America offers defunct bluesmen, a murderous Phil Spector, and over-zealous security personal near the Chelsea Hotel, NYC. Finch is a well-known performance poet and his poems have the immediacy and the dramatic impact of pieces conceived for the stage. Formal innovation is allied with themes that are resonant and deeply humane. Zen Cymru will win yet more fans to the Finch cult. More information. This book gathers together work from eight of Finch's previous collections. From the viceral immediacy of Make, the reader is drawn into a mesmeric experiment with form and language. In Sp ll, Finch plays with the brittle relationship between objects and signifiers, and develops his exploration of semiotics and meaning in Poems For Ghosts, where explodes the pomposity of formal, public language by crafting his own wildly funny and dark satire on the memes of officialdom. More information. The Welsh Poems might also be called Selected Experimental Poems and highlights Finch's more unusual excursions into verbal and visual trickery. The book covers work written over a period of two decades and is the first such large-scale selection of his work. More information. The new Finch title from Seren collects work since 1997. Food - the stuff that keeps us moving on. Not only does the collection include poems on dining, eating, preparing and thinking about food but Finch's verse sequence on walking - the perfect post-prandial activity - endemic in his life. The hills, coasts, rocks and heart-stop climbs are all here. Test Finch out on the world seen through haiku. See where William Carlos Williams had led him. Spend money in Soviet Russia. Hang around outside a concert at St David's Hall. There is a maturity in his handling of life and increasing engagement with death. His range is as wide as ever. The vital mix of humour, heart wrench, diatribe, and experimentation remains. More information. Seren Books. ISBN 1854111760 (1997) �6.95. Purchase at Amazon. "In Antibodies Peter Finch works on language from the inside defamiliarising through gestalt, process, list, and structure. The work uses chance as much as design, relies on visual perception as much as the internal voice. It forever echoes Coolidge's question 'why make new work when there is so much already around us?' The lines travel clear up from Dada to L=A=N=G=U=A=G=E. With the exception, of course, that Finch wants us to enjoy ourselves as we read and explore." - from the blurb. Published by Stride, 1997. More information. Read the reviews. Titles listed here can be ordered through Amazon, direct from their publishers or, in cases of difficulty, by e-mail from the Peter Finch Archive. Details here.